I've long had a tradition at TED of giving standing ovations only when I really think the speaker and talk deserve one. The first day was short, but none of the talks earned a standing O. The second day, I gave one to the TED Prize winner, not because she gave a great talk, but because of her amazing infectious enthusiasm. On Day 3, I spent a lot of time standing and applauding. There really were too many great talks to write about all of them. I've put below some of the highlights. The day started out well by having a session that technology folks (my people, the geeks and nerds) dominated. 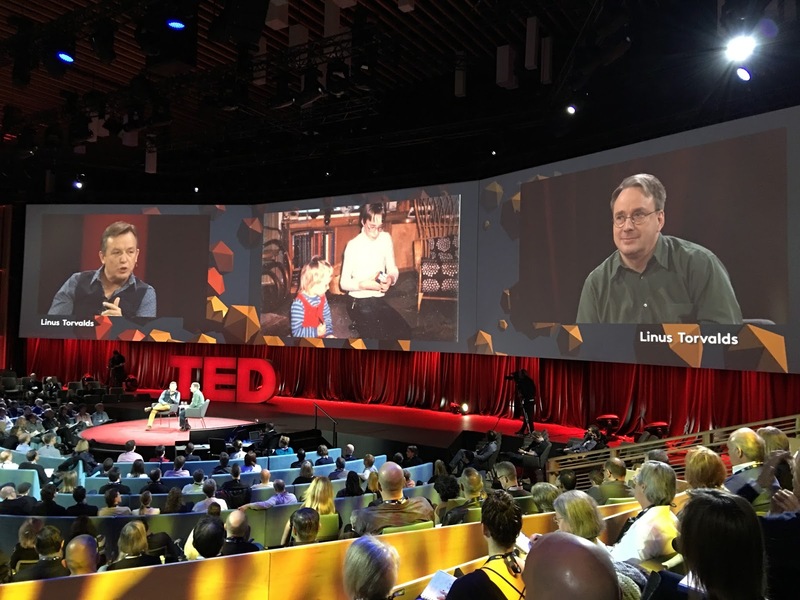 The first speaker was Linus Torvalds, the originator of Linux and, later, GIT. He also is the person who popularized Open Source. His name may not mean much to most folks, but Torvalds is geek royalty. He is also someone who is not a fan of the public eye, which is probably why Chris Anderson agreed to interview him rather than have him give an actual talk. I found the conversation fascinating, but I'm not sure that folks outside of the world of computers would find it so. I probably also enjoyed it because I could relate to so much of what he said. As other talks of the day would show, the geeks have inherited the earth. And, we will either save it or destroy it. I sought out Torvalds after the session because I have long wanted to ask him a question. (I found it amusing that he had the largest group of folks and many of them wanted a picture with him.) I had to wait awhile, but I got to ask my question, did he know about Kermit (my first big project) and did its openness influence Linux? He responded by saying that he used Kermit when he started developing Linux, but did not comment on the licensing stuff. Oh well, it still was fun to get to talk to him. Raffaello D'Andrea showed off some amazing drones. He demonstrated drones that could recover from failed propellers, ones that were basically wings that could hover or fly, and ones that could connect and fly together. His final demonstration used about 20 small drones (each smaller than the palm of his hand). They turned off the lights in the auditorium and they flew in different formations with white, red, or blue lights. It was quite beautiful and gave a real glimpse of what drones will be able to do. The day also included some other great technology demonstrations. Amit Sood showed off Google's amazing Art Project which includes really high resolution images of millions of works of art from over 800 museums. Meron Gribetz demoed the really cool Meta augmented reality glasses. Peter Diamandis announced an X Prize for AI to be shown and judged on the TED stage in 2020. Michael Murphy talked about his work as an architect. My ears perked up when he mentioned working with Paul Farmer (Tracy Kidder's Pulitzer Prize winning book about him, Mountains beyond Mountains, is one I consider essential reading) on designing third-world hospitals that promote health rather than making people sick. I found especially touching his current project to create a memorial in Montgomery, Alabama to commemorate the thousands of black lynching victims in the US. I hope to visit it once it is complete. Among all the standing ovations, one talk brought a tear to my eye. Dalia Mogahed, wearing her typical hijab, spoke of her experiences as a Muslim living in the US. She first cited some sobering statistics (probably from her book Who Speaks for Islam) such as that 80% of all US news coverage of Muslims and Islam is negative. Mogahed made the comparison that ISIS is to Islam what the KKK is to Christianity. The moving part was when she described her experiences after the terrorist attack on 9/11. There were anti-muslim attacks and protests the following days. She and her husband were debating whether to attend mosque the following Friday despite the cautions of many. They decided to go as an example to their children. When they arrived, the mosque more crowded than normal--about half the people were Christians, Jews, and others who came to show their support. That brought a tear or two to my eyes. That is what Christians should do. That is what I wish I had thought to do. I disagree with her beliefs, but as an American and a Christian I must defend her right to have them. I never thought I would type these words, but Al Gore gave the best talk of this conference. 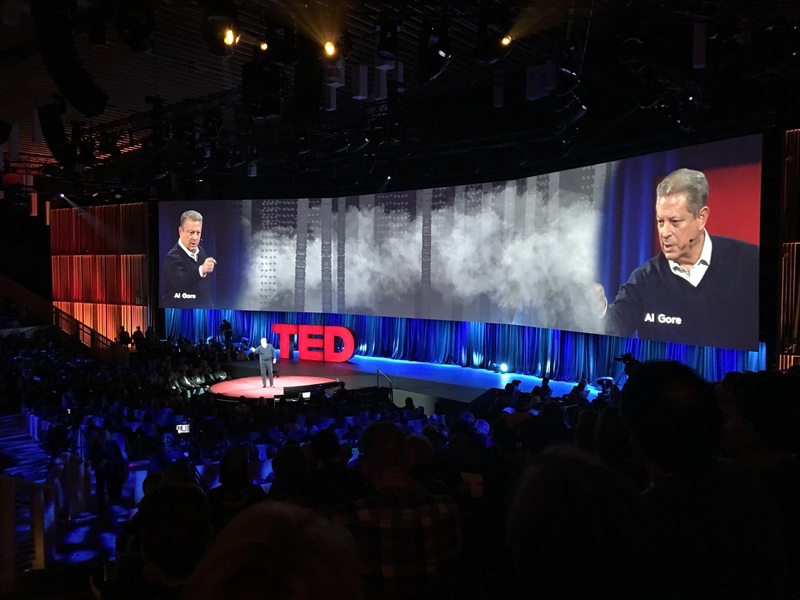 Ten years ago, before I started attending TED, Gore gave a famous TED talk tied to his book An Inconvenient Truth. He has done a few follow ups over the years at TED. He has always had good slides and material, but he often has been somewhat stilted and pedantic. Not this year. He was powerful and passionate. He was not the policy wonk of years gone by. He first spoke about the problems and evidence of global warming. It is amazing that some folks still doubt that it is real or man made, but his presentation left no doubt. What made this talk, however, was his sense of optimism about how things are changing and how technology and economics will make this something mankind can accomplish. It was truly inspiring. The audience response was a long, and heart-felt, standing ovation. Proving that technology is dangerous as well, Jennifer Kahn spoke about CRISPR and gene drives. In the simplest terms, scientists can now use these technologies to change genes such that they can guarantee the characteristics of offspring. So, you can introduce a gene drive that makes all mosquito offspring be male. In a few generations, they would be extinct. On the one hand, this is amazing--especially when you consider the deaths attributable to mosquito-borne illnesses. On the other hand, the technology is such that college and even high school students may be able to use it. Couple that with the possibility that it gets out of control and the consequences may be devastating. Kahn was mostly optimistic, but this is yet another area where we need folks figuring out what to do with Pandora's box before every kid is playing with one. There were also really good talks by people like Andrew Youn on solving world hunger, Luke DuBois about his work of creating art by using data such as the most common words in each US President's State of the Union speech, and Hugh Evans on his efforts to mobilize "global citizens" to attack global problems. There truly were too many to mention them all. Rhiannon Giddens (who turns out to be from Greensboro, NC) sang again and was even more incredible than before. As Mark said, her voice is a force of nature. She spoke briefly about the importance for her of reading about the lives of the slaves who originally sang many of the songs in her repertoire. I need to get some of her music and that of her group, the Carolina Chocolate Drops. 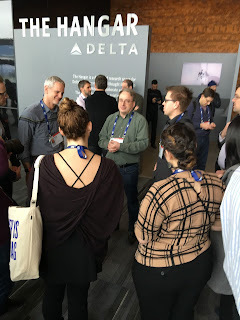 I should mention that the folks at TED are working hard to get talks up on their Web site as quickly as possible. The first one is Shonda Rhimes talk from Day 2. I expect Al Gore's to get posted fairly quickly. 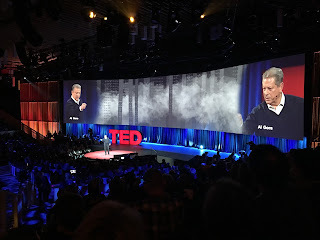 It was an amazing day at TED, the kind of day that makes me feel blessed to be able to attend. Wow. Tracking with you and appreciating the insights, the summaries, and the challenges. Thanks Bill.